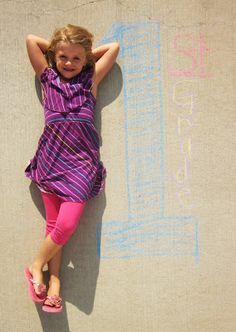 Super Moms have been pinning and planning since their child’s birth for ways to mark their child’s passage through school. Some plans are quite elaborate and expensive. Me? not so much. Truthfully, his first day of preschool I didn’t even think to take a picture before school. Sorry, kid! I wish someone had given me a few of these ideas before hand. So, I am posting this for my cousins and anyone else with little ones getting ready to start school in the next few years. And even us seasoned veterans (mine starts second grade on Wednesday) might pick up a trick or two. Or better yet, offer any ideas I may have missed in the comments. I love comments. These days it is so easy to snap a shot anytime and anywhere, there isn’t any excuse not to. You can get elaborate and have a professional photo shoot, or take the photos yourself with fancy props. I went ultra -cheap style. 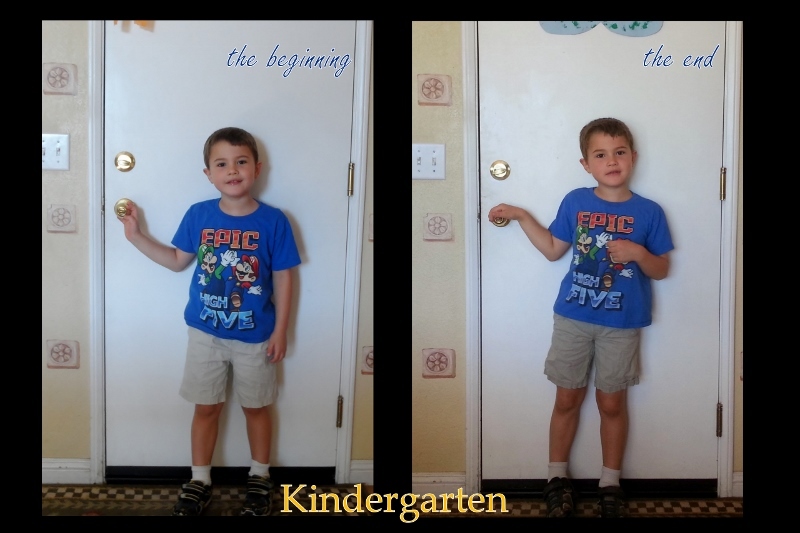 My son in the doorway in the same outfit on the first and last day of school. I put him in the door frame so I have the door knob and light switch as references. Even if we move someday, these are standard placements so I should be able to use any door for comparison. I saw this the other day from Where the Smiles Have Been and fell in love with it. 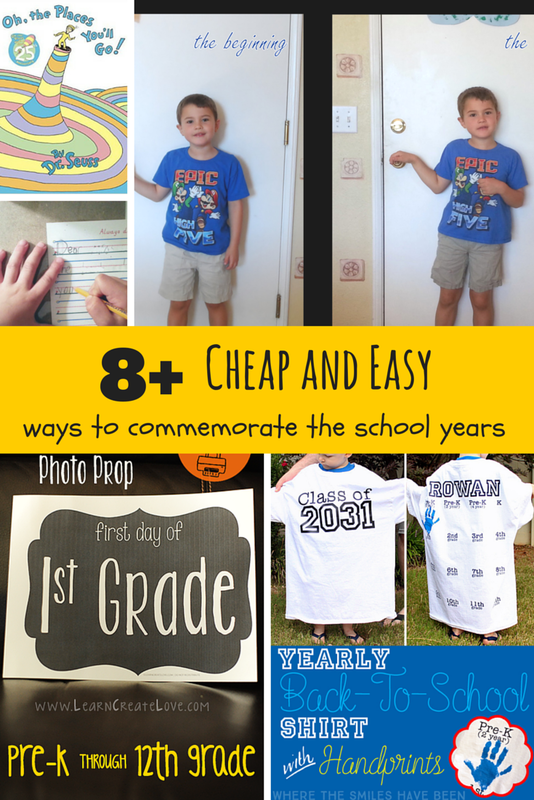 Two friends did the adult large shirt with the graduation year imprinted on the front and they take photos on the first and last days of school in the shirt. But the handprints on the back of this one is adorable. But, I admit my second thought was, “What kind of bribery is going to be needed to get him to do the handprints in junior high?” You could probably do this for $10 with a cheap white shirt and iron on letters. Some other moms I know use chalkboards or whiteboards to write down the day, grade and career they want to be when they grow up. Simple and cheap with what is on hand. Or you can print some cool graphics like this from Learn Create Love for the child to hold. Cost, paper and printer ink. photo credit Learn Create Love. Baby Center’s Blog has a few more ideas. Ugh! I wish I had seen the sidewalk chalk two years ago! No, it is not too early to start thinking about high school graduation in Kindergarten. Buy a copy of Oh The Places You Will Go by Dr. Seuss and have every teacher sign it like a yearbook and give it to your child as a graduation present. Cost $12 (disclosure: that is an affiliate link, I get a few pennies if you buy through that link). 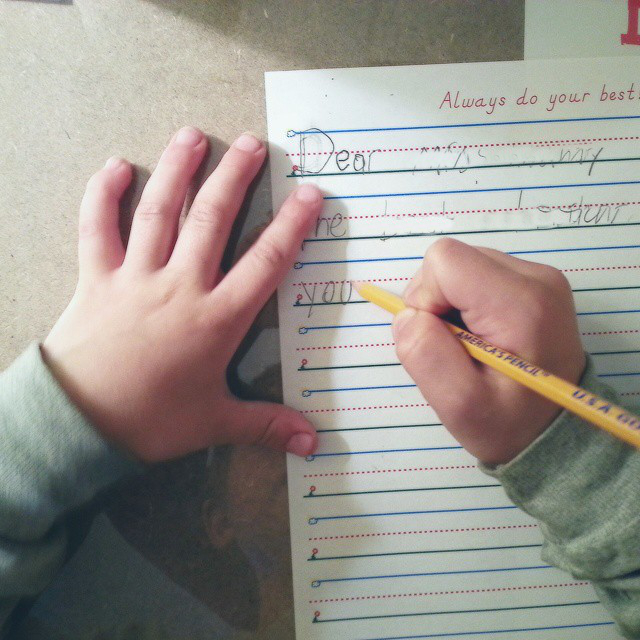 Have the child write a letter to him/herself every year. Give them back at graduation. Cost a dollar or so for paper and pencils/pens. Or you could do a letter at the beginning of the year to themselves at the end of the year. Make a Kindergarten time capsule. Save some of their Kindergarten artwork and writing, add some toys and a favorite book or two, any other mementos, and maybe an article of clothing (that blue Mario shirt is going in mine when I can sneak it out of his drawer). Wrap it up, maybe even let her/him address the card, then hide it where you will remember in 11 years then give it to them at graduation. 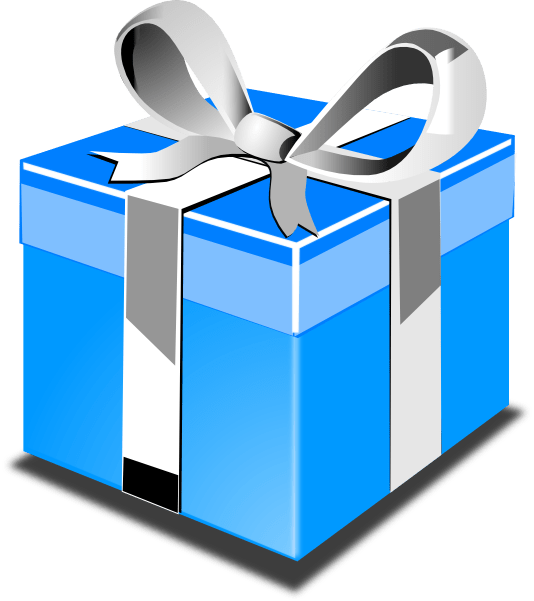 If you do it now, some of the contents will probably be a surprise for you too when they open it. Maybe that’s just me. You could also throw in things from every year if you want. Cost a few dollars for a box and wrapping paper. Those are the ideas I have seen. Any of you seasoned parents have any more to add? you found some great ways to make these milestone moments stay with us forever! 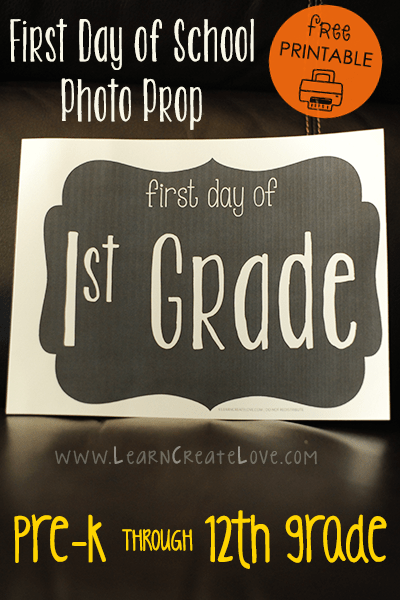 The first day of school picture is one of my favorite things to document as a mom. 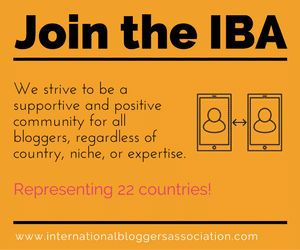 Thanks for sharing at #BloggersBrags. I am pinning this one. Thanks for pinning! Our teacher was great this year and invited all of the parents inside to take one more last picture of the kids before she sent us on our way. To go along with the 100’s we took before the bell even rang, ha ha!